When you are asked for the answer to an addition sum for example, how do you go about working it out? Well, I imagine that your method would depend on the sum itself. Perhaps you'd be able to calculate it mentally, "in your head". Maybe it would help to jot something down. Possibly, you'd reach for a calculator. Nowadays the calculator is very familiar to many of us. 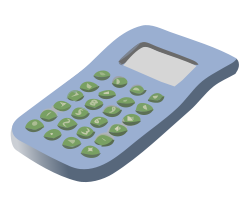 Calculators have become more and more advanced, and can do a multitude of different things. What did people do to save time working out more difficult problems before the calculator existed? In the old British imperial system of measuring, there are 12 inches to a foot and then 3 feet to a yard. It looks much more complicated than the metric system of length which uses base 10! To find out more about writing numbers in different bases, look at " Back to the Planet of Vuv ". Archaeologists have discovered bones and rocks etched with some form of numerical symbols dating back to 20 000 BC. However it has been very hard to find out exactly what they meant or how they were used. Between 9000 and 2000 BC, people in the Middle East were using stones, clay objects, rods and spheres to perform calculations. Each different type of object represented a different order of size in their counting system. Around 2700 BC, the Sumerians invented their own tool for calculating. This was a large block of wood or clay with columns traced out. These columns corresponded to the order of size in their counting system (which was base 60) - just like we write sums with units, tens, hundreds columns etc. Little wooden or reed sticks, or clay pellets were used to place on the columns to make numbers. This is one of the first versions of what we now call the abacus . Later, the Sumerians abandoned the objects and simply drew on the board. This meant they could "rub out" as they calculated. In the 5th century BC, similar devices were being developed by the Zapotecs of Central America and the Greeks. The original Greek abacus was a table with a raised edge, filled with sand. The columns were made by simply running your finger through the tray. In fact, it is thought that the word "abacus" comes from the Greek word "abax" meaning tray/table/tablet which originated from the Semitic word "abq" which translates as dust/sand. s was initially made from a small, flat piece of wood or bone and coated with wax. Marks were made using the pointed end of an iron instrument and the other flatter end was used for "rubbing out". This was in effect the first portable calculator! The Romans soon made a more sophisticated model - the grooved abacus. The wax was replaced by grooves cut straight into the wood and counters or beads were laid in them. During 100 AD, the Romans went a step further and made the first pocket calculator. This was also a groove abacus, made from metal. Beads could be slid along the slots. The Roman abacus was very similar to the ancient Chinese abacus. It is presumed therefore that the Roman form was introduced to China at some time. 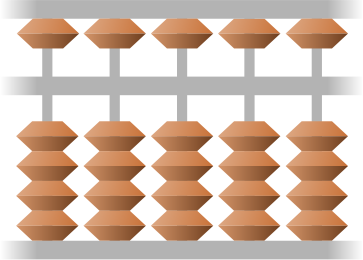 The Chinese abacus or suan pan has a rectangular frame with rods running from one side to the other. It is split into two parts by a horizontal wooden bar. Five balls slide along each rod below this bar (these are "ones") and two above ("fives"). In the middle of the 15th century the suan pan was introduced into Japan. Here it was known as the soroban, as this is how the Chinese characters are pronounced in Japanese. Between 1100 and 1500, paper gradually became cheaper and easier to get hold of and more people learned how to write. This meant that pencil and paper were used more often to help with maths. Huge debates raged about which method - paper or abacus - was better. With calculators and computers, the use of the abacus has declined even more. In China the Ancient Chinese abacus with seven beads is still being used by older people, but since 1980s, the Chinese have begun to teach children how to use the Soroban, the Japanese Abacus in a selection of trial schools. The reason is that the soroban displays numbers in base 10 in a way that makes calculating easy. The ancient Chinese abacus is not as suitable for mathematical calculations as the soroban. You may very well ask yourself why. Why bother using an abacus, which looks very complicated, when you could use written methods, a calculator or computer? Let's take a closer look at the Japanese soroban to find out. The Japanese used the abacus in the Chinese form, with seven beads, for several centuries. In the late 19th century the soroban was changed so that there was only one "five" bead above the bar and four "ones" below. It now displayed numbers exactly like arabic numerals in a base 10 system. Now, can you work out these numbers? Could you put the beads on the soroban in the right places to show 129? What about 1073? Next, you can begin to do addition and subtraction on the soroban. For example, to work out 33 + 65, you put 33 on the soroban, like the picture above, and then move the beads to add on 65. First move 50 down and 10 up, pinching the beads together, and then 5 down. The total is 98. Can you see it? Using the soroban takes a lot of practice. However, there are lots of benefits. People find that they can visualise numbers in terms of the beads so it helps with mental calculation. Also, using the soroban itself to do sums involves your fingers, which can make working with numbers much easier. In addition, you are using skills to do with spatial arrangements and physical manipulation which you wouldn't necessarily need if you were using pencil and paper or a calculator. We would really recommend that you have a go at using the soroban or Japanese abacus. We were introduced to the Soroban at the ATM conference in Ormskirk this year by a Japanese lady, Kimie Markarian. She was trained to become a 'human calculator' in Japan and worked processing numbers for a business there before the advent of computers. In Japan in 1965 nearly 1 million applicants took soroban examinations organised by various examination boards. Kimie believes that the soroban helps to change the way in which we process numbers so that it is able to change the way we think about doing sums. Many skilled soroban experts are able to add 15 three digit numbers in under 10 seconds with the soroban - less than the time it would take to say them all! The 2002 champion of soroban mental calculation added 30 three digit numbers in 6 seconds! You can even practise your adding and subtracting, and enter competitions on www.soroban.com/index_eng.html by clicking on "Flash Mental Calculation". Perhaps you can beat the 2002 Champion! ATM (Association of Teachers of Mathematics) publish booklets about the soroban and you can buy a soroban from them too. Tel: 01332 346599. Kimie Markarian is willing to do workshops for teachers and can be contacted on 01277 224574. "The Universal History of Numbers" by Georges Ifrah published by Harvill. "An Introduction to the History of Mathematics" (4th edition) by Howard Eves published by Holt, Rinehart and Winston. "How Maths Works" by Carol Vorderman published by Dorling Kindersley.